Worried about climate change? Now there's an easy investment for that. 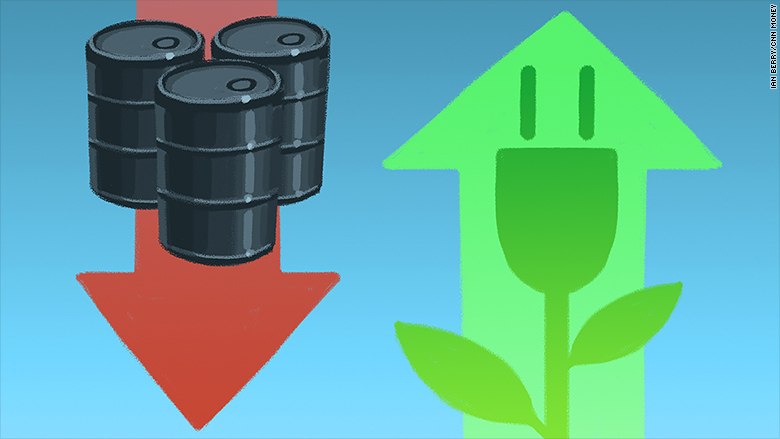 The first fossil fuel free stock ETF launched Thursday. The fund's rigorous screening process excludes not only oil, gas and coal companies, but also tobacco, weapons or gambling stocks. It's called the Etho Climate Leadership U.S. ETF and it trades under the symbol "ETHO." "We are fully divested from fossil fuels. For us, that's really just the starting point," says Ian Monroe, president and chief sustainability officer of Etho Capital, which runs the ETHO ETF. 1. It's made up of 400 U.S. stocks from many industries. A lot of other investments that fight climate change only invest in a handful of companies such as solar firms or tech companies. They have a narrow focus. 2. It goes beyond "low carbon." It doesn't own a single fossil fuel company in its portfolio. The launch of the Etho Climate Leadership ETF comes just ahead of the big United Nations Climate Change Conference, which starts Nov. 30. "We think impact investing is becoming mainstream," says Conor Platt, chief investment officer at Etho Capital. An increasing number of organizations like the Rockefeller Brothers Fund have pledged to divest from coal or all fossil fuels in the coming years. This isn't just about doing good for the globe. Etho Capital argues it's a smart investment because companies focused on making a better future should have higher returns. They ran tests going back 10 years to show that companies in their ETF outperform. After an initial "bad actor" screen, the Etho Capital fund managers then pick only stocks that are the best in their industry for their sustainability practices. For example, the fund includes Chipotle (CMG) and Starbucks (SBUX)but not McDonald's (MCD) or KFC and Taco Bell parent Yum! Brands (YUM). "We wanted to get to an investment product that the majority of sustainability investors would feel good about investing in," says Monroe. ETFs -- or exchange traded funds -- typically have lower fees than mutual funds and trade trade on an exchange, like securities. They often track stock and bond indexes, as well as other assets like currencies and commodities. They are growing in popularity among investors. The fee for the ETHO ETF is 0.75%. It's on the higher end for an ETF, but on the lower end for similar environmentally conscious investment options. Morningstar confirms this would be the first diversified equity fossil fuel free fund. Numerous other ETFs are fossil fuel free because they only invest in solar energy or bank stocks. Funds like the Huntington EcoLogical Strategy ETF (HECO) and the iShares MSCI ACWI Low Carbon Target (CRBN) aim to do something similar, but they are marketed as "low carbon." Etho Capital was started by Monroe, a Stanford professor with a background in the sustainability and climate movements, and Platt, who has had a long career in the investment world at Morgan Stanley and Brown Brothers Harriman. "We're surprised no one has done this before," says Monroe.